May you eat all you want and not gain an ounce. Now that would be something to be grateful for. In the United States, Black Friday is the day after Thanksgiving, the day that marks the start of the “holiday shopping season.” It’s a day of amazing sales and deep discounts. Some stores open as early as 4:00 am, with people staying up all night in the parking lot so they can be the first in the door, as the very best sales (aptly named “doorbusters”) are only available in limited quantities. In other countries, Boxing Day is similar. Probably everyone who lives in the US is familiar with Groupon and other coupon sites. A few weeks ago, Living Social Deals offered a half-price VIP Black Friday shopping extravaganza at the mall nearest to my house. Normally $20, this deal for two shoppers was discounted to $10. What did you get for your $10? Parking in a reserved area of the mall, access to a VIP rest and refreshment area, and transportation on an electric cart to and from my car. I’m still marveling at the cleverness of the mall at making just shopping there something that you can pay for. Here’s the take away message for Black Friday. If you want something, have planned for, made a smart determination that this item is needed by you, and you can afford it, feel free to purchase that item while it’s on sale. Otherwise, stay home. Rest. Enjoy your family. Eat leftovers. Watch a football game. Read a book. Just because the stores are desperate for you to purchase doesn’t mean that you have to be desperate to buy. Instead of risking getting trampled to death on Black Friday why not buy secondhand on eBay. You’ll still get a bargain plus buying preloved items is better for the environment. 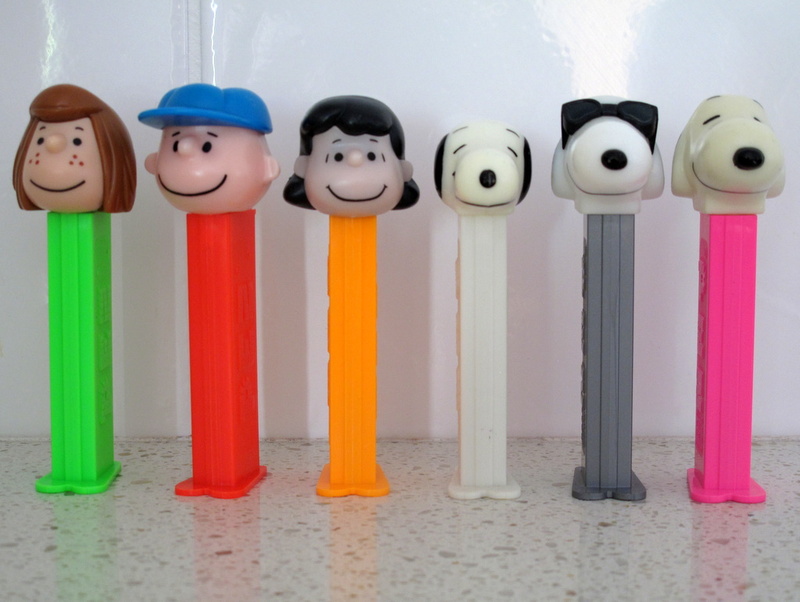 I recently sold these Peanuts Pez dispensers on eBay and made three people very happy. The buyer who was happy to add them to his collection. My son because the money went into his bank account. And me because they are one less item of clutter wasting space in my home. My parents made it to me safe and sound and now I get to enjoy then for the next five days. « Cindy’s Weekly Wisdom ~ How do you store your books? Black Friday sounds my idea of hell Cindy! In the UK, our mega sales start on Boxing Day (December 26th). I never go to those either. Happy Thanksgiving to all friends in the States. Hadn’t heard of Leiden – is that another name for the Netherlands or part of the Nederlands? Colleen wrote that. I don’t know about Leiden either. Black Friday also sounds like hell to me, but last year I went to Target in the afternnon on Black Friday. The place was vacant! An employee told me that sevearl hundred people had been waiting when they opened at 5am and that all the specials – and all the crowds – were gone by 9am. At 3pm, when we went, it was quiet as could be. click on Leiden on the post and you can read all about it. It is a place in the Netherlands. Happy Thanksgiving to those in the US and Leiden. For all the rest Happy Day. Black Friday! Ugh! We stay off the roads and away from all of that. I don’t like crowds and we either make our gifts or buy them at sales with coupons way before this. Haven’t been to the mall in the 3 1/2 years we have lived here. I don’t like shopping. We just had a series of Mission and Ministry dinners at church, and the tables are decorated cutely and differently for every dinner. I doubt anyone would notice if the tables were just covered with cloths and left at that but then, no one suggested that I be in charge of decorating for several different dinners. Thank goodness we have “The Marthas” who attend to that chore. My church dinners change food/menus on a theme, but tables are white cloths – nothing more. And it’s more than OK with everyone! I, too, hate crowds. But I do like the idea of planning ahead and having the Christmas shopping done by this weekend. We have a local craft fair here on Friday and I shop for unique, local, handmade items that will be special for my friends. Then I’ll be knitting my way through December but the rest of my shopping will be done. Of course, since I live in the frozen North and have to ship packages anticipating holidays is sort of a given. It does make for a more peaceful December, not worrying about any more shopping. I am not worrying about shopping or planning yet (after all, in the US tomorrow is Thanksgiving) and I hope I won’t be sorry. Colleen, hope you have a good visit with your folks! exactly my thoughts as well. 😉 have a happy thanksgiving! ideealistin, a german thing we can look forward to is the crowded christmas market, for me a love-hate relationsship again. A happy Thanksgiving to Cindy and all American friends! The shops sound like a nightmare – like Colleen, I keep well clear of the Boxing Day sales – I don’t think there is anything I need enough to face those crowds. Certainly something to give thanks for! Colleen, Enjoy your time with your family! Cindy, Thanks for your contribution today. I loathe Black Friday partly because I dislike crowds. I wonder if there is a corollary between the dislike of crowds and dislike of clutter. Happy Thanksgiving to everyone in the US and Leiden! if I think about it, it depends highly on the purpose of the meeting. if its a crowd in front of a stage where a good concert is going on, I like it. it gives me the shivers sometimes, but its a good mood. I guess its because the first idea is a common and mutual interest, where you enjoy something together, while the second people consider themselves in competition. and I just dont like competition in whatever context. Interesting. I don’t like to do things with what I call “ten thousand of my newest, closet friends” either. I’d be OK going to a controlled setting with thousands of people (like a concert where there are assigned seats) but not to ACL a hugely popular music festival that happens annually just one mile from my house. 60,000 people attend the open-air multi-stage concert every day, and I will never be one of them. Last year we had this HUGE accident in a german city, where a dance festival ended up in a stampede. 21 people were killed. I dont like mass events. really. thousands is alright, tenthousands is not. Wow! I just love love love your blog! How you post every single day is beyond me. 🙂 I love the fact that you offer a tip every day, along with an image and explanation of the item you’re decluttering, and then a bit of gratitude at the end. It’s perfect! I hate to be a copycat, but I may just do the same thing when and if I ever start a blog! 🙂 Keep up the great work! some days it is beyond me too. At the moment I have my parents staying and it is difficult to find the time to respond to comments. Cindy in doing a great job for me as usual though. Luckily she wrote two of the post this week. Thank you for dropping in the make such a nice comment and may I extend to you a warm welcome to 365 Less Things. I appreciate a little ego boost every now and again and you have started my day out well. 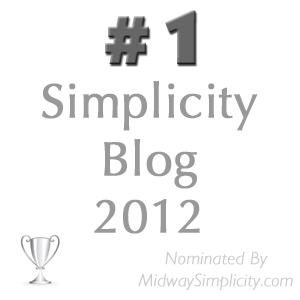 Jamie – The blog is a huge committment for Colleen, no doubt about it. Because she or I (usually her) repond to every comment personally, It can take hours of her time, and that’s without writing the post first! Plus, she makes no money from the site. I’m sure she could do it without me, but it does help to have someone backing you up. I’m started to dislike shopping. I especially hate busy shops, I want to be able to wander around without a ton of people blocking my way (that’s why I usually shop during the week – much more quiet). Yes, I’m spoiled. I don’t think that is spoiled I think it is sensible. The part about meeting with friends or going after work with colleagues for a drink is great and since the knick-knacks they sell don’t even appeal to me after the drink I am not worried too much. The overall thing may be gruesome – but it is always what you make of it. Actually walking through the Christmas market every couple of days (it’s the way to the train) is sort of sparking the Christmas feeling a bit for me. I even gave in to buying some decoration (after I decluttered decoration …. oh, well): two sheets of beautiful wrapping paper that I intend to display as artwork before christmas and then use either as wrapping paper or for making gift tags. Though I don’t think I am going to give many presents, I want to give cookies like every year and maybe either jam or chutney. I have never made that myself and am actually looking forward to the experience. hihi, Ideealistin, you just havent found the right stand, I suppose. Here: Overpriced tacky trinkets mostly made in China, hoards in shorts and flip flops (I’m wearing shorts today), drinking overpriced beer and sodas from containers that won’t be recycled. There: Costly but exquisite handmade items, snow on the ground, intriguing drinks and snacks, beautiful carols playing, recycling containers every where, people talking and laughing around me in a language that I can’t understand, so if they’re saying something stupid, boring or wrong-headed, I don’t know. Ah, sounds lovely. you made me laugh. Not understanding people is a nice thing when you are abroad. you dont care and pretend they just gave you a compliment. I have always been an anti-Black Friday person… it is such an undisguised ploy to make everyone feel that they HAVE to buy gifts THIS weekend or else! Then, it progressed to – you have to buy them on Friday only or else! Then, it became – buy them on Friday morning or else! Now, it’s starting on Thanksgiving Day!! Pretty soon, it will be Halloween! It is just so unrealistic to believe that you can’t find these deals at other points in the year. I purchased a $40 covered sandbox for my kids for $9 on clearance – I happened to be looking in a garden section of Walmart for Christmas decorations, and all the summer stuff was so cheap that they couldn’t even advertise it. Those are the TRUE Black Friday deals! Anyway, keep up the great work, Colleen AND Cindy! 🙂 You have inspired me to tackle some more junk piles today before I start decorating for Christmas! Good job Jamie. Sounds like you’ve got the right attitude going!